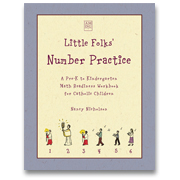 This workbook introduces basic numbers and number concepts while also linking numbers with Catholic doctrine in your children's precious minds! Provides practice in writing and counting the numbers 1-10. Workbook concludes by introducing sequencing and simple addition. 49 pages. 8½"x11"
Tour this title within the Kindergarten Interactive Guide!